Your Press Releases will reach thousands of media contacts, bloggers, and consumers. Package limited to sending press releases about a single company. Your press releases will reach thousands of media contacts, bloggers, and consumers. All press release reach thousands of media contacts, bloggers, and consumers. PRBUZZ also has partnered up with Awesome Penny Stocks and we now can help micro-cap stock companies with their press release needs. Press Releases are an important way for penny stocks and other micro cap stocks to gain public exposure. 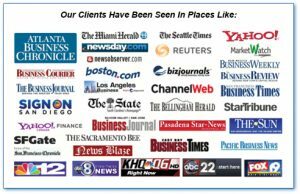 Placement of your press release in thousands of News sites, Blogs, Social Networks, Newspaper Sites, TV News Sites, Radio News Sites, Search Engines. Attention SEO firms, resellers, publicists, web developers and reputation management firms. Thank you for making our business so popular. We now have a special package just for you. Send an unlimited number of press releases for all of your customers for on….